Anxiety disorders are one of the primary mental health problems affecting children and adolescents today. Given the wide range of stressors associated with growing up, it is important that our children have appropriate skills for coping with anxiety and other difficult emotions. The Child Anxiety Network was created by Dr. Donna Pincus and is designed to provide thorough, user-friendly information about child anxiety. We accept no advertising. The Child Anxiety Network is also designed to provide direction for those who are not sure where to turn when they think their child or a child they know may need professional help to cope with anxiety. The "I Can Relax!" CD will help your child develop the skills they need to learn to relax during times of stress. Dr. Donna B. Pincus speaks with Dr Timothy Johnson on ABC News regarding The Anxiety of a Hoax; Do children suffer increased anxiety when asked to lie?" 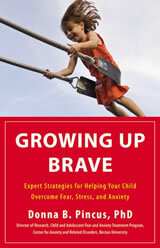 Dealing with a shy child Donna B. Pincus talks with "Today" show host Matt Lauer about how to raise a shy child. Looking for an effective new tool for helping your child cope with stress and anxiety? Coping cards have been used with children to help them learn ways of talking positively to themselves during stressful situations. Dr. Donna Pincus, creator of The Child Anxiety Network and a specialist in child anxiety and its related disorders, frequently gives talks about child anxiety and related disorders, parenting, and helping children and families cope with stress.